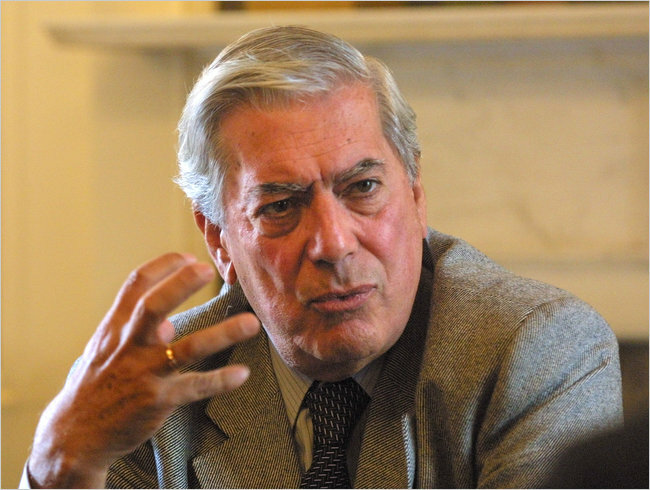 Peruvian novelist Mario Vargas Llosa won the 2010 Nobel Prize in Literature today. The first South American to be awarded the honor since 1982. Read the full story at the New York Times and most other major news outlets. This is a great honor for Vargas Llosa and I hope it will spark some interest in reading and literature in Peru, where average Peruvians in my observation read very little. This entry was tagged literature, Mario Vargas Llosa, Nobel Prize, Peru, writer. Bookmark the permalink. It might not prompt any more reading…but I bet you’ll see a lot more pirated versions of Vargas Llosa’s work for sale by street vendors! I guess you know a little about Peru. Maybe you don’t know our country, our people,our culture. Go to the public libraries, check quilca avenue or avenida grau were are located the stqnds of the pirate booksellers. I’ve been to those places or to the boksellers stands inside or outside the public and the private universities and I saw more pepople purchasing books over there than the few doing that on Barnes and noble or borders. Thanks for your comment. I’m sure Peru does have great literature and poetry – which I wish I had more time to explore myself. My comment about reading in Peru was simply based on my personal observation during the 1-2 years that I was teaching ESL here in Cusco. The students simply did not read much and the institute didn’t encourage reading either. We once attended a workshop where the presenter claimed Peru ranks low in reading, I don’t know all the sources of his info, but it seemed reasonable at the time.